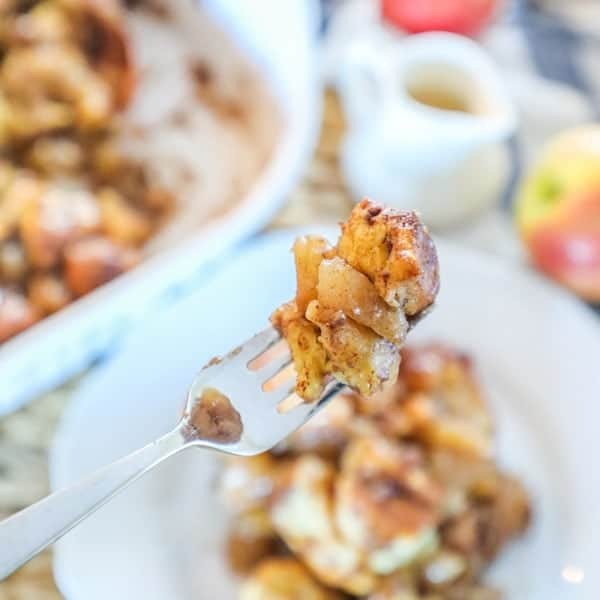 This Apple Fritter Breakfast Casserole is absolutely loaded with apples, cinnamon roll bites, and of course glaze! It is every bit as good as you might imagine! This is perfect for a breakfast, brunch, potluck or holiday celebration. With just a few simple ingredients, this casserole comes together in minutes and feeds a crowd. Someone way wiser than me once said that “Necessity is the mother of invention,” and that my friends is how this casserole came to be. I have been busy and crazy, then realized I was supposed to show up to a brunch with a dish in hand… like in the morning. So I took inventory and decided we would make it work with what I had since there was 0 time for a trip to the store. And work it did! I am super excited to share this with you guys because my friends at the brunch were all raving about it (insert blushing here) and I got multiple requests for the recipe. I figured I better figure out what exactly I put in it and what I should call it so I could properly document it and pass it on to you. The good news is that I dubbed it the Apple Fritter Breakfast Casserole and got the recipe all written down, and the BETTER news is that this is just too easy and delicious! It was perfect for taking to a potluck since it easily feeds 10-12. I think it would also be a really great addition to a Christmas morning breakfast. 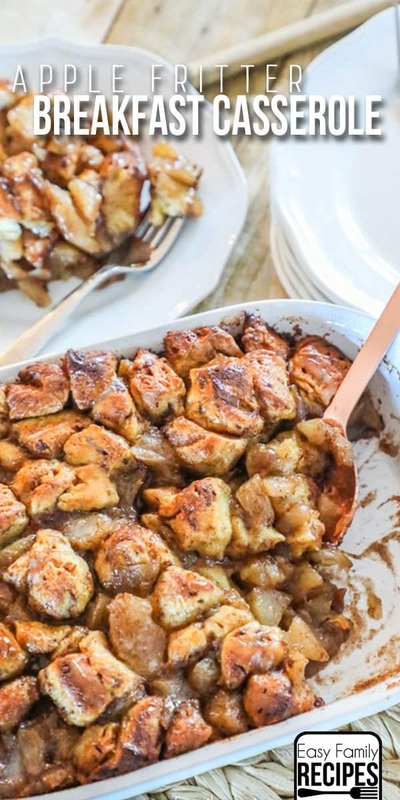 With the delicious flavors of cinnamon rolls, along with the flavorful apples it really is perfect for the season, and you won’t have to spend all morning in the kitchen because you can have this from fridge to oven in about 10 minutes. This casserole is really great to add a little sweetness to your breakfast or brunch. Since it is pretty sweet and provides a lot of ooey-gooey goodness, It pairs really well with more traditional savory breakfast items like bacon (see my easy trick on how to make bacon in the oven here! ), eggs, fresh fruit, and a cup of coffee or tea. When you serve up this breakfast casserole, make sure to have a big serving spoon as the casserole naturally divides so you don’t need to cut it with a knife but rather just scoop it out. You will also want to have forks and napkins because it is delicious, but it can also be a little messy to eat if you aren’t careful. If you need more ideas for what to serve at a breakfast or brunch, check out my favorite recipe for breakfast casserole, or see all of my easy breakfast recipes here. I am going to walk through how I made this breakfast casserole for you step by step with my notes and tips below. If you just want the quick version, feel free to scroll down to the recipe card at the bottom of this post. With just 5 simple ingredients, you are going to love how this dish comes together so quickly! 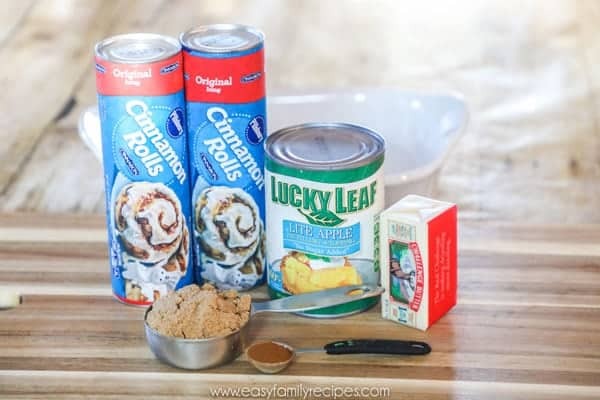 2 cans (12.4 oz) Pillsbury Cinnamon Rolls– I use the regular roll, classic flavor (sometimes labeled Cinnabon) with 8 rolls in it. Grands might work too, but they are made slightly differently where they are actually rolled with cinnamon in between the layers so I think the regular ones work better. 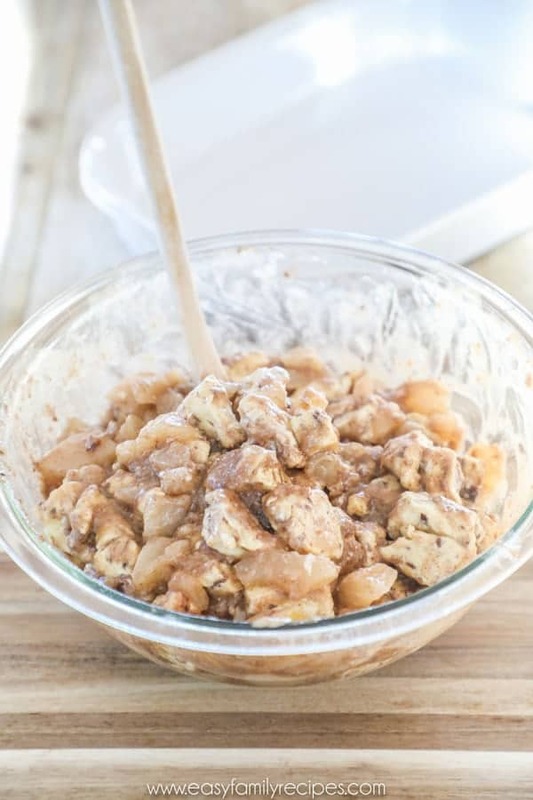 1 can (20 oz) apple pie filling- You can get light or regular for this. 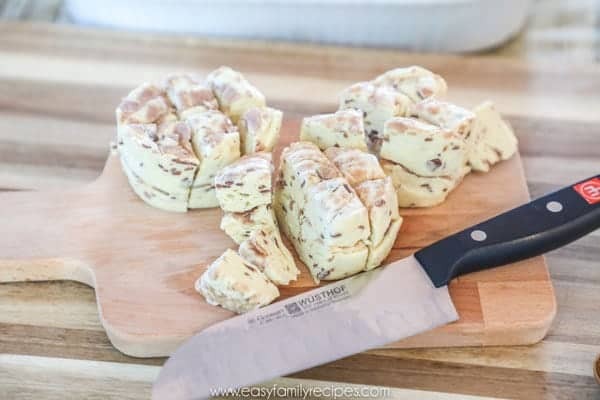 I have been asked a few times, so I thought it worth mentioning, although the pie filling is already sweet, it really does need the extras below to make the casserole more caramel like and bring it all together. Chop the cinnamon rolls into 6-8 pieces each. You could go even smaller if you want, but a minimum of 6-8 is a good start for bite sized. Open the can of apples and chop them up into small bite sized pieces. This can be messy, so I found the best way was to open the top of the can all the way up, then run a long sharp knife through the apples inside the can several times to chop them up right inside the can. As you pour them out later, you can chop any you may have missed as they are added. It is a little non-traditional, but surprisingly effective and mess free! 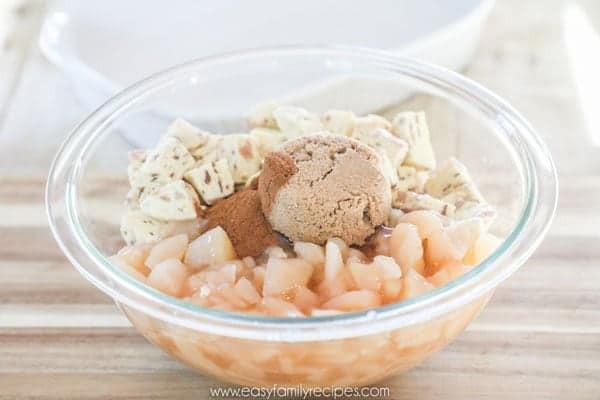 Place the cinnamon rolls, apples, melted butter, sugar and cinnamon in a bowl and mix them until everything in combined and the cinnamon rolls are coated in the apple mixture. This will just kind of look like one big gob of messiness now, but that is okay. It is going to bake into one big can of deliciousness! Spray a large casserole dish with cooking spray. As I mentioned above, I really recommend using ceramic, like a Corningware casserole dish (pictured) or glass, such as a pyrex dish. Next pour the cinnamon rolls and apples into the dish and use a spatula to make sure it is evenly distributed in the dish. Place in the middle rack of the oven and bake for 40-50 minutes or until cooked through. I don’t cover mine at all while baking, but depending on how your oven cooks, you might want to cover the top loosely with foil toward the end of the cook time if the top starts to get browner than you want. Drizzle the glaze from the cinnamon rolls over the top of the casserole. Serve warm and enjoy! I really hope that you and your friends and family enjoy this as much as we did! It is the absolute perfect dish for fall since it brings all of those wonderful flavors together. If you do get a chance to try it, I would love for you to leave me a note in the comments. Even better, if you are on Instagram, snap a pic and share it in your feed or on your stories and tag me @easyfamilyrecipes so I can see what you are making! 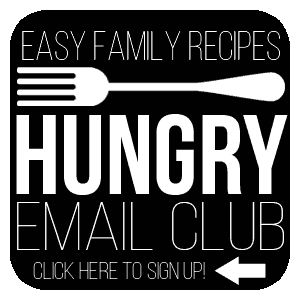 Oh and before you go, if you are like me, and need a regular rotation of recipe inspiration, then the VERY best thing you can do is sign up for my e-mails (for FREE!) to get a note in your inbox on what new recipes I have cooked up lately and dinner inspiration for the week ahead. To sign up, click here or on the button below. 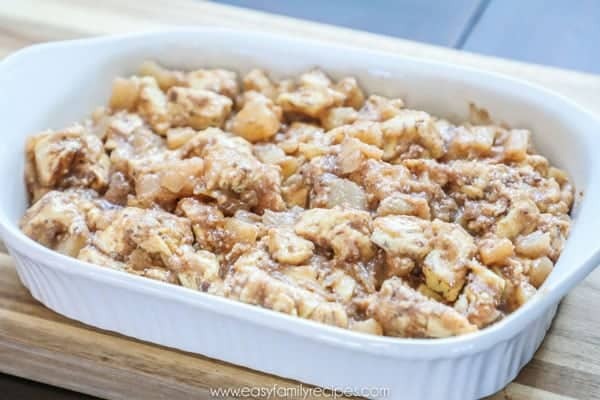 This simple breakfast casserole is the perfect blend of apples, cinnamon and breakfast bread to create a mouth watering morning treat. 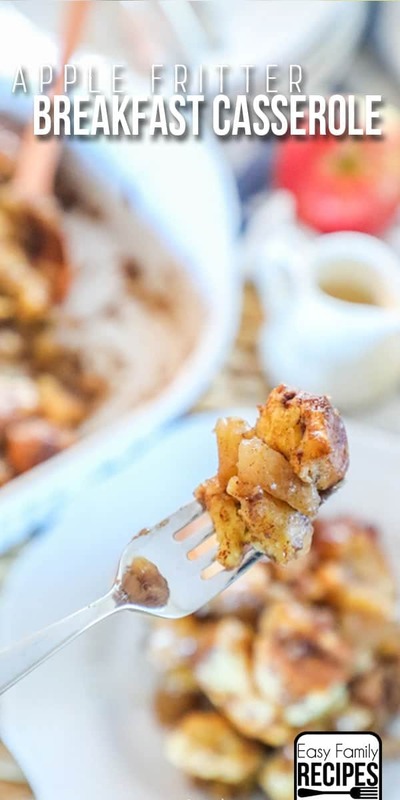 Apple Fritter Breakfast Casserole makes the perfect dish to bring to a breakfast,brunch, or special occasion, and even a great addition to a Christmas morning breakfast. Chop the cinnamon rolls into 6-8 pieces each. Open the can of apples and chop them up into small bite sized pieces. 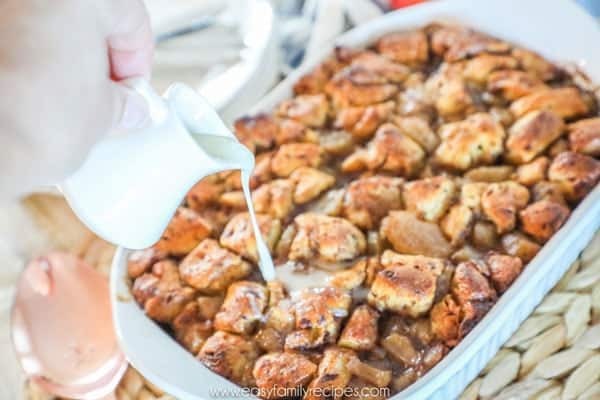 Place the cinnamon rolls, apples, melted butter, sugar and cinnamon in a bowl and mix them until everything in combined and the cinnamon rolls are coated in the apple mixture. Spray a large casserole dish with cooking spray and then pour the cinnamon rolls and apples into the dish and place in the middle rack of the oven and bake for 40-50 minutes or until cooked through. R u there right now? 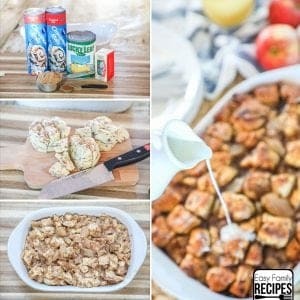 Have a question about apple fritter casserole, could u make it night b4? & cook n morning? Cook u cook it nite b4 & warm it slowly n oven next morning? I haven’t tried that but it might work. I would definitely leave the glaze off until after you reheat it though. Of course i want 2 make it 4 tomm..
Can this be prepared the night before? Why not wake up earlier or prepare dough the night before and make proper apple fritters? It’s not too hard. That doesn’t look appetizing. I’ve made this multiple times for work appreciation breakfasts and it’s a hit every time! I’ve now tried it with cherries and blueberries in place of apples and all are equally delicious. I still want to try peaches! I make it the night before and warm it in my roaster oven the next morning and it’s amazing! Crockpot??? Has anyone either baked it in the oven and kept it in the crockpot??? Or even total crockpot method?? Do you have to use canned apples or will it not be sweet and gooey enough with just fresh apples? I have had readers make this with fresh apples and have good results. I haven’t done it personally though. A few questions for you. What size casserole dish and can this be made the night before and cooked in the morning? Thanks a bunch! It looks delicious! I used a 2 qt corning ware dish in the photo. You can use most larger casserole dishes. I have had luck making it in advance, however it will need to bake longer since it will be colder going into the oven.